A brief introduction: Your "cache" is all the files your computer has downloaded from the websites you visit. This does not mean actual "downloads." Have you noticed that after you visit a page once, it loads much faster the second time? This is because your computer has already "downloaded" information and images from that website. Sometimes, however, we want the computer to download new information and images, rather than load what it already has. So, we delete the files it has already downloaded, forcing it to download the new files. This is typically a very simple process. Please note, "Cookies" and the "Cache" are two different things. Your "Cache" is the information you store about a website, while "Cookies" are the information website stores about you. For example, when a website saves your username and password, it uses a cookie. This does not effect your cache. From the drop-down menu, select "The beginning of time"
Make sure that all options are unchecked, except for "Empty the cache". Alternative method: Press down Ctrl+Shift+Delete to open up a browser settings menu. Check only "Temporary Internet Files." - To clear the cache for a single page: hold down "Shift" and click "Refresh" on the toolbar, or hold down CTRL and press F5. Click the "Detailed Options" button. Uncheck everything except "Clear Entire Cache." Thanks to weatherseed for this information. 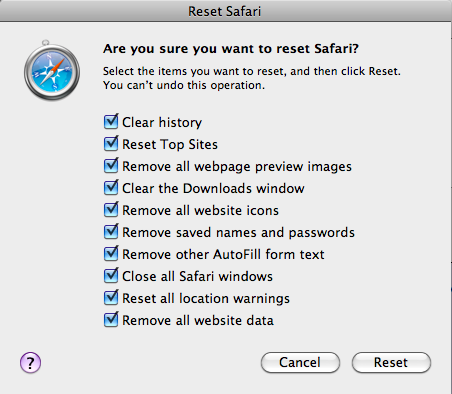 Click Safari -> Empty Cache. Click "Empty" on the dialog box. Click "Advanced" and select the "Network" tab. Under the "Cashed Web Content" section, click "Clear Now." Note: If you do not see your browser's version listed here (Internet Explorer 5.5, Firefox 1.0, etc. etc.) it is strongly recommended that you upgrade your browser. The latest browsers typically have more features and improved security. Used in checking the above information for correct directions. The HelpZard provides links to the homepages of the various browsers. Also, if you follow these steps exactly and the problem is not fixed, the problem is not caused by your cache. Try scanning your computer for viruses or spyware, or trying the other solutions recommended by the HelpZard. 5.20.13 - Updated entire post. Thanks to the Archknights. * Clearing your cache will not help if your ISP is also caching web files. AOL is famous for doing this. They hold a copy of web files on their "proxy" servers, and when you connect to AQ and download stuff, you're actually only downloading AOL's copies of the files. And those copies may be several days old. * If you are Guardian player, you can try playing using both the Free and Guardian servers to see if one works better for you.